The Suffolk and England player analyses hands or an aspect of play involving a local player taking part in a regional or national competition, or in a county league or event. It can be quite cruel to get a bad board primarily due to the No Trump range you have agreed to play with your partner. Here is an example from the qualifying round of the Tollemache, where to compound the problem the opposition also caused confusion by failing to make a normal bid. At one table Eric Newman, representing Suffolk, was East, partnering Mike Sherer, and had agreed to play a strong No Trump. Since that was what he had, Eric opened 1NT. Isn’t the South hand now a completely normal 2♥ overcall? Anyway, Eric’s South chose to Pass and Mike bid 3NT. South led the ♥7, Eric played low from dummy, North won with the Jack and returned the ♥6 , on which South played the Queen and dummy’s King won the trick. It looks like South has 5 Hearts and is trying to keep communications with North. North’s return of the ♥6 is consistent with an initial holding of J65 or J63. Declarer needs at least two tricks in Clubs to make the contract, even if the Diamonds produce four tricks, so the Clubs have to be played at some point. If Declarer knows that South has 6 Hearts there is a safety play available to Declarer, which we will observe later in this article. Unfortunately from Eric’s point of view the Heart play to date suggested 5-3 was at least as likely as 6-2; plus, if South really had 6 Hearts and the King of Clubs he had “forgotten” to bid the normal 2♥ over 1 No Trump. So Eric ended up taking a completely normal and correct Club finesse and the contract failed. Very bad luck. At another table Karen Pryor, sitting West, faced a very different situation. We play a weak No Trump, so I opened 1♣ and South overcalled 1♥. Karen showed a good club raise with 2♥, I asked for a Heart stop by bidding 3♥ and Karen bid 3 No Trumps. (3 No Trumps was also the contract at almost every other table although 5♣ turns out to be a safer contract). So this time West declared 3NT rather than East. The lead was the ♥J which Karen ducked, then the ♥6, on which South played the Queen, so Karen won with the King. Karen checked that the opponents hadn’t agreed to lead the Jack from Jack to three in partner’s suit (some people do, or at least used to do). Having established that the Jack here was from a doubleton Karen now took the safety play in Clubs, played a Club to dummy’s Ace. This guards against the singleton King in South’s hand, and the King was indeed duly played by South on the Ace (although, I recall, with some reluctance). Karen would have been happy giving up an overtrick if North had held the King of Clubs since there would have been no entry to South’s Hearts and the contract would have been secure. Thirty pairs attended the recent Suffolk event, the Mid-Anglia Pairs, held in Woodbridge, which is scored by cross-imps rather than match points. For those sitting East/West there were three excellent slams available to bid, one of which turned out to be a lot harder for the pairs to reach than the others. First, a question about style if playing Acol with four card majors. What do you respond to partner’s 1♠ opener holding: ♠J104 ♥Q10842 ♦Q98 ♣A6? This relates to the third slam in this article. So here is the first slam. Playing in either 6♣ or 6NT there are no losers outside clubs (the spade loser goes on a top diamond) and there is one loser in clubs if the clubs are played the normal way of Ace followed by low club towards the King Jack. Taking this line the probability of making seven is just over 50% (singleton Queen or clubs 2-2). These odds are not good enough to risk bidding the grand slam; you would want odds of nearly 70% (and that is not taking into account the fact that some pairs may miss the small slam). However, you would expect the majority of pairs to bid a small slam, with the combined 33 count plus a good six card suit. In practice ten pairs bid or made a small slam (67%), with one pair having a shot at the grand slam and failing. Here is the second slam. Again, an excellent slam. On the only slightly awkward lead of a diamond declarer can play the ♣K, cross to the K♠, pitch a diamond on the A♣, play the A♥ and then cross back to the A♠ to play the top hearts. Declarer makes the small slam almost all the time that the trumps break no worse than 3-1 (90%). In practice no declarer made less than twelve tricks. Seven pairs (just under 50%) bid this slam. Now the third slam, from the second half of the competition. What was your answer to the question at the start of this article? Whether you can get to the excellent slam in hearts depends partly on how West responds to 1♠ by East. If the response is 2♠ (on the “heavy” side), the heart fit may not materialise and the limit of the hand in spades is 5♠. Three of the fifteen pairs played in spades. If the response is 1NT, although the slam can still be bid it is going to be quite a bit harder. For instance the auction could go 1♠ - 1 NT - 3♥, now 4♣ should be a cue bid showing good heart support, a maximum 1NT response and a club control. This gives the partnership a chance of diagnosing the slam potential but East may still worry that the 5-level is not safe and not venture to the 5-level. In practice no pair bid slam where East was the first to mention the heart suit. Is West good enough to respond 2♥ to partner’s 1♠ opener in Acol? Applying Robson’s Rule of 14 the answer is 'yes'. Add your High Card Points to the length of your longest suit and if it comes to 14 you are OK bidding 2 over 1. Only two pairs bid the excellent 6♥ contract, congratulations to both of them: Trevor Stiff playing with Gill Newton, and Sam Wilson playing with Bim Wilson. a) X b) 1♦ c) Pass d) something else? Part B: what is the largest number of trumps you have held in a contract declared by the opponents? Although it is a two part question, both questions in fact relate to one hand which occurred in one the matches played by Suffolk in the qualifying weekend of the Tollemache (the EBU inter County teams of eight competition). Eight teams (about a quarter of the field) qualify for a final held in February. I think any of X, 1♦ and Pass might work on some hands and not on others. On the day I decided to Pass, partly because of the vulnerability and partly because my partner Karen Pryor would have been able to come into the auction herself with a lot of the hands where we wanted to compete in a Major. I have to say that playing a system, as North /South were, where all the weak No Trumps go through a short club opener, I would have thought it was very much with the odds to respond 1♠ with the North hand, and then bid 2♦ if South responds 1NT. On the other hand our opponents were part of the Merseyside and Cheshire team which was successful in qualifying for the Final, so perhaps they find they get a lot of success passing those hands and letting the opponents sort out how to proceed. The net result of this auction was that Karen found herself in a situation I have never seen before, defending a Club contract holding eight trumps headed by the Ace King. Karen drew a couple of trumps, then exited with a third club, so all declarer made was one Spade trick and one Club trick. We collected plus 500 for 1♣ off 5. Sadly this was of very little benefit to our team, since at the other tables East / West played in a normal contract of 5♣ by West, making, scoring plus 400, so Suffolk only got a few imps out of this board. At the qualifying stages of the Suffolk Championships Teams, held over one day, 12 teams competed the first round, then seven teams competed the second round, reducing to four teams who will now play head to head knock out matches held privately. Here is an elegant end play executed by Peter Sutcliffe as his team marched on to the leading position at the end of the second round. It had been a hard contested auction. Peter as North opened 1♣ which was either clubs or a weak No Trump. East, Ralph Parish, contested with 2♣ for the majors. South, Chris Green, jumped to 3NT, declining a scientific auction probing for partners major stops and preferring a pressure bid which might allow 3NT to make even when it was technically beatable. The bid had worked well, since there are nine top tricks in No Trumps, partner has the Ace of one major and Q9xx of the other, plenty good enough on this hand to prevent the opposition from running fiver tricks before you get your nine. However Ralph as East was not finished – producing an excellent bid of 4♥, converted by West, Paul Whetton, to 4♠ Both 4♥ and 4♠s are only one off doubled, much cheaper than defending 3NT. But Peter as North now chose to bid 4NT rather than try to defend, and that too was the correct decision on the hand. What would 4NT here be in your system? I doubt many pairs would have an agreement. To play, both minors, or to play in partners minor? Chris as South thought it was probably to play but very reasonably chose to bid 5♣ in any case, which became the contract. 5♣ was also the contract in the other room, but not surprisingly it was played by South not North. Mike Sherer as West led the ♠K, and declarer had no way of avoiding one loser each in spades hearts and diamonds. Contract down one. At Peter’s table it was East not West on lead and Ralph quite reasonably led the A♥, then switched to a spade; but unfortunately it was now already too late to stop Peter making the contract. He won with the ♠A, drew trumps in two rounds, played a diamond to the Jack, ruffed a heart and exited with a spade. At this stage he had 10 tricks organised (one spade, two diamonds and seven clubs) and the opponents now had to give him the 11th. He didn’t care whether it was Ralph or Paul who won the spade trick. If Ralph won the spade trick he had now run out of diamonds and would either have to play a spade, conceding a ruff and discard, or would have to play a heart, setting up the Queen of Hearts as the 11thtrick. If Paul won the spade trick he had now run out of hearts and would either have to play a spade (once again conceding a ruff and discard) or play a diamond away from King, setting up the Queen of Diamonds as the 11thtrick. What if Ralph had led his singleton Diamond at trick one? That doesn’t beat the contract because Declarer’s diamond pips are too good. At trick one the diamonds played are 8 – Q – K – A. Then after trumps are drawn Peter could play the ♦2 from dummy, Paul would have to split his 9 and 10, let’s say he plays the 9. Peter would win with the Jack and play his ♦4 to dummy’s 6, forcing out Ralph’s 10, making Peter’s 7 of diamonds a master, and the 11thtrick. There is another line which works for Declarer, which Peter was aware of. It is a much worse line than the one chosen by Peter at the table, because it requires West to have both ♠K and ♠Q. After ♥A and a spade switch Declarer wins with the ♠A, preserving the ♠J. All seven clubs are now played and West is squeezed. In the 4 card ending he has to keep a spade honour to avoid the ♠J becoming the 11thtrick (with the diamond finesse working) and he has to keep three diamonds to stop declarer being able to get a third diamond trick after a finesse. So he has to throw his last heart away. Then declarer exits with a spade to West’s bare honour, and West has to play a diamond away from the King, which enables declarer to make three tricks from the diamonds to go with seven clubs and a spade. A classic strip squeeze, since West is in effect stripped of his little heart which would have provided a safe exit once thrown in with the Spade. The dealing machine for the Suffolk Teams of 8 produced this truly remarkable slam hand. There are three possible grand slams available for North/South. The least good one is 7♦, which requires the diamonds to break no worse than 4-2 (84%) plus no heart ruff at trick one (half the 3-0 breaks) which reduces the odds to just under 75%. If everyone is going to bid at least a small slam those odds are good enough to bid a grand slam. The next best slam is 7♥ which is almost 100%, the only way the slam could go off would be if the spades broke 8-0 and somehow the person with eight spades had not come into the bidding non vulnerable against vulnerable. For a completely 100% grand slam 7NT is the spot, with six heart tricks, one spade, three clubs and four diamonds , making a total of 14 tricks, one more than required. In fact the diamonds break OK, so there are 17 tricks available. At some tables South opened with a game forcing 2♣ bid, very reasonable since a lot of the time the hand will produce nine tricks in No Trumps if there is a club stop. No doubt this was a surprise to North, sitting there with a four loser hand. A positive response in hearts, followed by a heart raise by South would usually get the pair to the Grand, after a cue bidding sequence, provided North had available a way of finding out that South had the Ace of Trumps. There are some practical difficulties in bidding the Grand slam if South doesn’t open with a game forcing bid. So how did everyone get on with this hand? The hand was played 24 times. The top spot of 7NT was reached six times. Congratulations to the pairs that got there. 7♦ was reached three times. All the other pairs got to a small slam: 6♦ four times, 6♥ eight times, 6NT twice, and 6♠ once (that was unfortunately a result of a bidding misunderstanding and the contract went off). There were a number of interesting slam hands at the recent Suffolk Teams of 8 Championships with a lot of IMPs riding on them. Board 4 is the first one. How this should be bid depends on what methods EW play. If they play a weak NT, West will open one of the black suits and by far the easiest route to slam is if East is then able to make a strong jump shift. West with three card support and three Aces will be able to take control either by starting a cue bidding sequence or by simply using Blackwood. If West opens a strong NT and the parntership's methods enable East to bid 3♥ as a slam try, West should cooperate with a cue bid of 3♠ and East should continue the search for slam with a cue bid of 4♣. It is harder to bid if East isn't able to make a jump shift on the first round. If, for instance, the weak No Trumpers open 1♣ and it then goes 1♥, 1 NT rebid, East now has a lot of catching up to do to convey the strength of his hand. Similarly if East just transfers into 2♥ after a strong NT opening. There is almost no way 6♥ could go off, and double dummy you can make seven (via a club finesse which in practice you wouldn’t take). This is very much a slam everyone would like to be in despite only having a combined 29 count. So how did the players at the Suffolk teams of 8 championship get on with this slam hand? 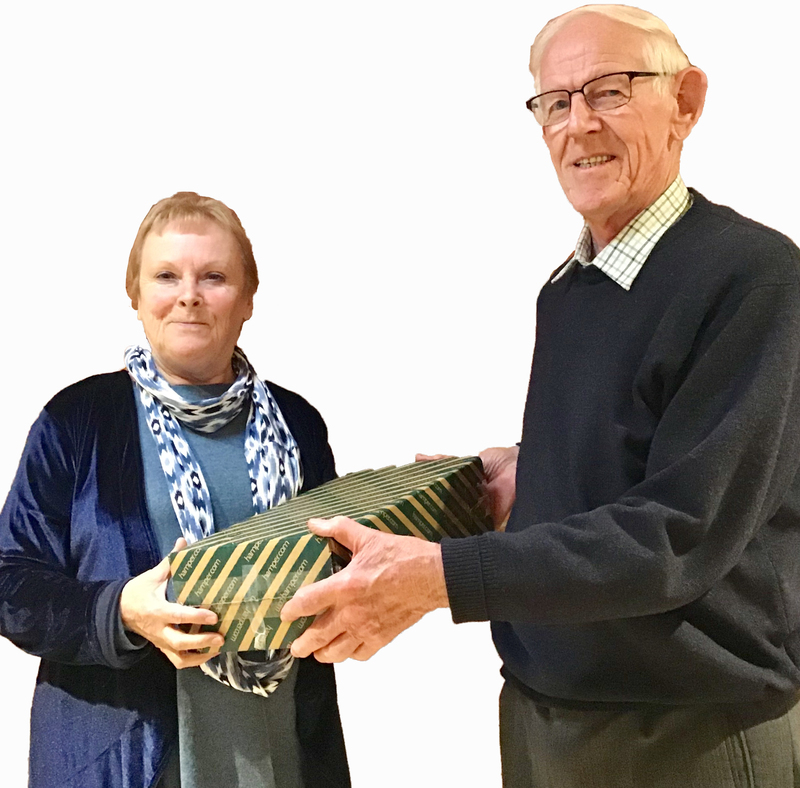 In the recent Felixstowe Congress Swiss Teams two teams obtained 92 VPs, and therefore split tie procedures were employed to determine the ultimate winners: Helen Mason, Norman Less, Peter Bushby and Mike O’Reilly. Peter Bushby had to cope with an unusual opening bid on one board in one of the early matches. Once upon a time transfer pre-empts were quite popular but not so many people play them these days and so they don’t turn up as often as they used to. North opened 3NT. Most people play that as a long running minor, but this pair played that 3NT showed clubs. Peter had the East hand and chose to overcall 4♥: although the hand only has 14 points, the six card Hearts suit is good quality (with the 10 and the 9 as well as the two higher honours); you would perhaps prefer to have a small singleton in clubs and the Ace somewhere else, but you can’t wait for the perfect hand. This hand is one that in an uninterrupted auction might open 1♥ and jump to 3♥ on the next round, so it is plenty strong enough to bid 4♥ over the conventional 3NT. If in their system North could have had as strong a hand as he actually had then South might have bid 5♣, and now the best that East West can do is sacrifice in 5♥, for minus 500 versus minus 600 defending 5♣. As it happened South passed, and Peter was minus 100 in 4♥ undoubled, which was an 11 imps swing in when team mates bid and made their game. Transfer pre – empts have a technical disadvantage, which is that they give the opponents two goes at coming in. When Peter bid immediately over the transfer this showed a good hand, with a weaker hand he could have waited for the opponents to complete the transfer then bid. An immediate cue bid of 4♣ should show a strong take out, a delayed double of 4♣ a weaker take out. Against sensible opponents you won’t often find you can collect a big penalty, but doubling both 3NT and then ♣ should be penalty oriented. A ROAD PAVED WITH GOLD? At the quarter-final stage of the Gold Cup 64 boards matches are played in eight-board stanzas. The first half of the match was very tight. After eight boards we were five imps up, after 16 boards seven imps up, after 24 boards six imps up, after 32 boards two imps up. In that kind of match one stanza going one side’s way can transform the match, and that is what happened in the fifth stanza. There were two big boards which both went our way; both bidding decisions. Both close decisions in my view, and could have gone either way, but on this occasion it was our day. See what you would have done with each of these hands. You are South with both of them. Board 40 Neither Vulnerable, dealer West. On Board 39 when my right hand opponent leapt to 4♠ on what was likely to be a hand with the high card points fairly evenly distributed I took the view that his hand was probably quite distributional; probably short in something, most likely Hearts. I thought it likely that we would not be able to cash four tricks. 5♥ could have been expensive in some scenarios, but that is what I chose to bid. In the other room my hand doubled 4♠, which made for 790, while 5♥ was only one off doubled for -200. 11 imps in, but on another day we could have been beating 4♠ with 5♥ going for 500 or more. On Board 40 I decided I was going to bid slam if partner showed three out of five of the Key Cards, but not otherwise. The 3NT bid meant that partner was unlikely to have only one of the five Key Cards so although the 5-level was not 100% safe I thought the trade-off of continuing to investigate slam was worth it. With a slightly different auction in the other room the opposition bid 6♠ which on most defences, and in fact the defence found, would have made if the Diamond finesse was working. Another 11 imps in. We had been playing for around five hours with just a small imp difference between the two teams. These were only two boards, but the match dynamics after them were now significantly different. On another day both those decisions could have misfired and although we won in the end by 42 imps those two boards could have swung the match the other way. The Suffolk Summer League is an intra-club team of eight competition with matches played over 24 boards, scored by IMPs and converted to Victory Points (with a total of 80 Victory Points at stake in each match). In a recent first division match between Clare and Stansfield there was a dramatic board with a lot of IMPs riding on it. With the East West cards the Clare pair (Cleopatra Hensby and Andrew Moore) bid to 6NTs. Although with the favourable club layout it is possible to collect four club tricks, on almost any defence the 5-0 Spade break scuppers the contract. For Stansfield Richard Evans partnering David Unwin was declarer in the more promising contract of 6♠. The 5-0 Spade break came to light when the ♠A was played. Now the best approach would seem to be a cross ruff, particularly since ♠ Q1075 sit over ♠J864. If things work out declarer is hoping to make six tricks on a cross ruff plus the Ace of Spades already cashed, and so needs another five tricks. Double dummy there is a very lucky way of getting those extra five tricks: during the cross ruff the ♦Q comes down and the Jack can be cashed without getting ruffed, so the extra five tricks come from ♦AKJ plus ♥A and ♣A. But the odds of that being the right line are small. Instead Richard took the very reasonable line of trying to get the five extra tricks from ♦AK, ♥A and ♣AK. When the ♣K gets ruffed the defence can play a trump reducing one of the tricks available by cross ruffing and leaving declarer a trick short. With a few key matches left to play Ipswich and Kesgrave currently lead the First Division, with Colchester second and Clare third. The EBU Premier League is played over three weekends in three divisions, with the winners of the first division being guaranteed to represent England in the Home Internationals, the Camrose Trophy. The top two divisions each contain eight teams, each year two are relegated from the first division and two promoted from the second. Suffolk has just one pair playing in the Premier League, Karen and Malcolm Pryor. At the end of the first weekend their team is lying second in the second division, in the promotion zone (Richard Evans writes). After West passed as Dealer, Malcolm opened 1♥ and East (Sarah Bell) chose to overcall 4♠. This put pressure on Karen, since Malcolm might have had only four hearts and a better hand, but she chose correctly to push on to 5♥. After two passes, now it was East’s turn to feel the pressure. Rather than unilaterally deciding to bid 5♠ she chose to make a so called “action double”. After one has made a pre-emptive bid an “action double” gives partner the message “I was thinking of bidding one more, but I will hand the decision to you in case you think we would be better off defending”. So now, having been minding his own business for the duration of the hand so far, West was now called upon to make the critical final decision. The auction was up until this point duplicated also at our team mates table. I think it is a difficult call for West. At our table, looking at three card support for partner, correctly reading that his opponents had a 10 card fit in hearts, and looking at uncertain defensive values, he chose to bid 5♠, which went one off (we made one club and two diamonds). In the other room our team mate decided to pass the “action double”, and collected 100 when 5♥ also went one off, with the defence getting one spade, one club and one diamond. It is a tight call, and 5♥ doubled might have made if the Spades were 3-0 but I think passing the double is likely to be right more often than not. TAKING MATTERS INTO YOUR OWN HANDS - SUCCESSFULLY! The blue pointed Swiss Pairs event organised by Ipswich & Kesgrave last weekend was won by Conor Bignell and Jo Harpur with the fine score of 109 VPs out of 140. The event was superbly organised, and as part of their 60th Anniversary Celebrations the Club this year provided an outstanding two course meal for all participants after three of the seven 6 board matches. Conor and Jo came into the final round needing at least 13-7 out of the match to take the top prize. Sometimes in that situation the opponents seem to get all the key decisions, and your fate depends on them. On other occasions you get an opportunity to take matters into your own hands. Conor found himself faced with an interesting decision on the board above. After North passed Conor opened 1♣ (only 10 points, but a reasonable 6 card suit and decent support for either red suit). Opposite the passed hand South could have overcalled any number of Spades, but chose a full blooded 4♠ . After two passes Conor was in the spotlight. In their system a double by Jo would have been penalty oriented (some pairs play take out doubles after an overcall all the way up to 7♥ , although obviously the higher the bidding the more likely you are to pass the double). Conor took the view that a) Jo hadn’t doubled for penalties, so didn’t have good Spades or a lot of points b) his own hand contained no Spades at all c) his hand had uncertain defensive values d) his side were not vulnerable, so if 4♠ was making he could show a profit provided he was less than 4 off. He therefore took a decision to bid 5♣ , which was only one off doubled, and an excellent result on the board. North could have bid 5♠ , and at some tables North did take the push to the 5 level, but 5♠ goes off so that is an even worse score for North South. The EBU Summer Meeting has just concluded with a weekend of teams events. After 10 rounds of Swiss the top 16 teams go into an A and a B final, the rest of the field continue playing for another 5 rounds of Swiss. Only one Suffolk pair took part, Karen and myself, which is perhaps disappointing, but the numbers were down across the board; clearly London is not popular as a location, the only time in the last forty years that the event has not been held at a seaside resort. One board contained the worst hand I can remember seeing for a very long time, a true Yarborough with not even a 10 in it, and 4-3-3-3 shape. Surprisingly, players holding this hand had a key role to play. Your partner opens 1♥, and the next hand overcalls 1NT. You decline to take part and the next hand bids 3NT which ends the auction. So what do you lead? Almost everyone faced with this decision just led their partner's suit, after which Declarer could make the contract if they played the club suit for no loser. The only lead to guarantee beating the contract is a spade, allowing partner to clear the spades before declarer can get anywhere near an 8thtrick let alone a ninth. The spades have to be led from the Yarborough hand and obviously it won't get in again after trick one. There is a case for the leading a spade not a heart – the opposition seem to be prepared for a heart lead, and dummy didn’t use Stayman so probably doesn’t have four spades. The EBU Summer Meeting kicked off last weekend with the main Pairs event, comprising 15 rounds of Swiss Pairs, starting on Friday evening and finishing on Sunday afternoon. It was staged in London as a one off while the Eastbourne venue used for the last couple of years is refurbished. Three Suffolk pairs took part, Caro Hunt and John Heath, Peter Bushby and Norbert Voelker, Karen and Malcolm Pryor. In the past there have been a lot more than three Suffolk pairstaking part, and I would be interested to hear from pairs who didn’t attend this time about why this was so. There might be valuable information here for the organisers. One noticeable thing in an event of this quality is that the bidding tends to be very competitive. If you have a trump fit on a part score hand so will the opposition and you will find everyone joining in. Pre-empts are frequent and you will often find yourself having to make decisions at a higher than usual level. Peter Bushby has been very impressed with Mike Lawrence’s 2017 book “Judgement at Bridge 2” and has been experimenting as recommended in the book: the point of pre-empting is to hurt your opponents’ bidding; you should experiment with how far you can go with this. The hand above is an example of Peter and Norbert putting this advice into practice in their second match in the competition. Peter opened a weak 2 Hearts with the North hand, Eastdoubled and Norbert bid 4 Hearts. 4 hearts can go for 800, but East West can make a small slam in Spades or No Trumps, or a grand slam in Diamonds. You could argue that East West should still get to a slam in diamonds, but the point is that the aggressive pre-empting game caused them a lot of difficulties. In the end they took the low road, with West bidding only 5 Diamonds and East passing that. That was a lot of match points for Peter and Norbert who won the match 15-5.